The Real "Tungaw": A Chicken Mite! - 2NGAW! Did you know that the term “tungaw” (Filipino word) is actually a type of chicken mite whose bite can be very itchy? I certainly wouldn’t want to get bitten by one! This parasite is usually found in chickens – thus its name – but is also known to bite humans. Farmers or fowl handlers will tell you how this pesky little creature is something they would not want to be on their skin and on the animals they are caring for. This mite progresses through 5 life stages in its short life cycle: egg, larva, protonymph, deutonymph, and adult. 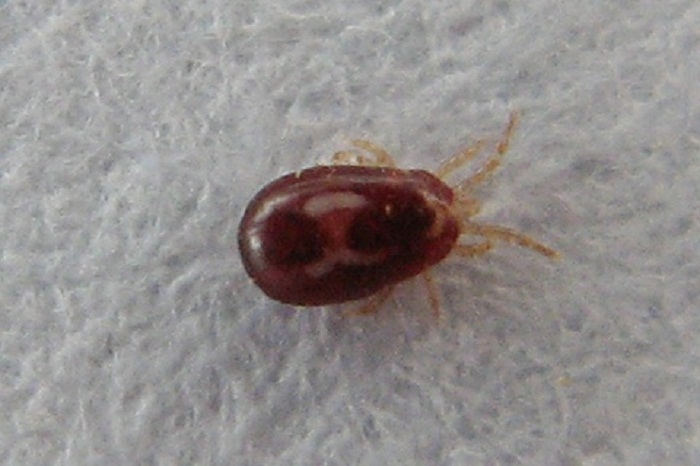 Although has a dull grey coloring, the mite can turn red as it becomes engorged with its victim’s blood. After satiating itself with the host’s blood, this parasite easily hides in various cracks and crevices in the victim’s body where it mates with other mites and then lay eggs. Tucked inside its hiding place, the chicken mite then rests for the entire day, waking up at night to feed on its host. Because they feed on blood, the presence of these parasitic mites is like having thousands of tiny vampires living and feeding off your body! It is no wonder that infected birds could suffer from anemia. If left unchecked, the birds can die from mite infestation! Thankfully, there is no evidence to suggest that these mites are capable of living and reproducing in the bodies of human hosts yet their bite can be so itchy that it might require treatment. Humans bitten by a chicken mite could potentially develop dermatitis and skin lesions!